I was born in Ft. Scott, KS, but I can’t really tell you what my childhood home was like — I had many. My dad was an Air Force pilot, so we moved every few years: Louisiana, New Jersey, Delaware, Oklahoma. So mine is one of those stories that wherever you hang your hat is your home. The first house I remember was in Japan. Third grade. I remember it because that’s where I got my first dog. I went down to the Japanese village, and a Japanese couple had puppies out in the yard — little, white, fuzzy ones. They put one in my outstretched hands and made hand motions that I was to take it. Lady was the only dog I had until I got married. I always wanted to be a veterinarian. Mom and Dad bought me a toy doctor kit. My brother and I took the syringes and pumped air into these huge Japanese beetles and blew them up! Good thing I didn’t become a vet! I never owned a doll. My grandmother once gave one to me — trying to convert me, I guess — but I left it on the airplane when we came back from Japan, and she never got me another one! I’d rather play with boys: football, cardboard sledding, homemade skateboards. I always had stuffed animals. I loved playing veterinarian with them and doing some very amazing surgeries. I met Buck — the love of my life — on a racquetball court in Okinawa, and it was love at first sight. He was — what else? — a pilot in the Air Force! We got married in 1980, and we continued hanging our hats in the many different places we called home. I got my first golden retriever when we lived in Las Vegas. I was in an obedience class with my Irish setter, and the instructor had two beautiful goldens. I said, “That’s going to be my next dog.” It was, and that’s the only breed I’ve had since. Buck retired from the USAF in 1995 and got a job with FedEx — that’s what brought us to Memphis. My veterinarian, Amy, ran across Delta Society, an international organization that provides gold-standard therapy animal training, testing, and registration. She asked if I thought we could start a therapy dog program here, and I said yes. I’ve always wanted my dogs to have a job. I was hooked from the beginning. My first golden, Sage, and her daughter, Kacie, got registered and started visiting. Amy retired from therapy work, and Mary Ehrhart — who I met at a training class — and I founded Midsouth Therapy Dogs in 2001. It has about 40 teams now, and we’re a 501(c)(3). Therapy animal training includes learning basic obedience skills and accepting a vest, collar, and/or bandana. When we put those on, the animals know they’re on the job. Most walkers in nursing homes have tennis balls on the bottom, which dogs associate with play, so that’s especially challenging! We walk around on crutches. We make loud noises. Some dogs back up, hide, or cringe; others don’t care. And that’s how you weed them out. The ones that accept the equipment, the noises, the smells — they’re going to be all right. One thing I’ve never had to teach my goldens is how to approach a bed and lay their head down on it. They just do it — it’s amazing. We bought BarkNBray Ranch in Arlington in 2007. Six and a half acres. By then, we had four golden retrievers — all registered therapy dogs. After about a year, I told Buck we needed a horse. He said horses were too big and suggested a miniature donkey instead. That’s when I bought CeCe. Well, CeCe began to think she was a golden retriever! She couldn’t fit through the dog door, so she’d lie outside and stick her head through — and bray! I decided CeCe needed a buddy, so I purchased Nestle. Nestle became my first registered therapy donkey. Now we have nine donkeys, and two of them are working on their therapy training. My goal is to have all my animals be therapy animals. 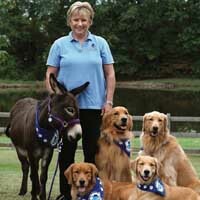 I’m building a good bloodline of therapy dogs — we’re in our fifth generation — and I want to build a good bloodline of therapy donkeys. You know, you have animals because you love them and they’re your pets, but I feel mine also need a job in life. I thought I could share a little of their unconditional love with people. In doing this, I learned that not only did my animals make people happy, but what I got in return was above and beyond what I ever expected. My first therapy visit was with Sage to a rehabilitation facility. They had a magician in there — who had a bird! Sage was very interested in birds, and I thought, “Oh, my god!” Sage had a very hard time behaving herself, but she did! The miracle of animals is the unconditional love they provide. When your job involves people who are hurting you provide a listening ear and some warm fur to run their hands through. I’ll never forget Nestle’s first visit as a registered therapy donkey. That morning, I brushed each donkey’s coat as I always do, and when I got to Nestle, I whispered in her ear, “Nestle, today is your day!” She grinned at me, showing all of her teeth! I gave her a bath, then I blow-dried her coat. Nestle was so brave during all of this — just as she had been trained. I put a beautiful purple halter on her, hooked up the donkey trailer to our truck, and loaded her up. We pulled into Page Robbins Adult Day Care Center’s parking lot, and everyone was so excited! Many suffer from Alzheimer’s. The first man who walked out of the center said he had raised donkeys, mules, and horses when he was young, and he thought Nestle was the greatest thing ever. It created a past memory for this man. It was such a special day — for everyone involved! My biggest reward is the satisfaction of knowing that my therapy dogs and I brought a smile and a shade of reality to a hospital patient’s stay. Nothing can prepare you for the death of a loved one — animal or human. My first love was my first dog, Lady. She introduced me to the meaning of unconditional love. Before each therapy visit, I groom my dog — bath, brush, nails, ears, eyes. We both put on our therapy dog garb, and off we go. I drive, of course!! It’s hard to believe that when there’s pain and emptiness in our hearts, just the mere touch of an animal’s warm fur can fill that painful, empty heart with unconditional love. As a therapy dog handler, I’ve seen a lot of sad frowns turn into smiles. Keeping my emotions in check was my main concern when I started this because I cry at Hallmark commercials! You don’t get desensitized to it, but you get where you accept other people’s emotions and accept that they’re not yours. You know you’ve done something to help them face their emotions. One of the most joyous situations was on a therapy visit, when a little child who had not smiled or moved his arm since surgery reached out to pet my dog. The child also waved good-bye to us! One of my biggest fears is that when I’m working with cancer patients going through chemo at St. Jude, I’ll call a boy “she” or a girl “he,” because you can’t always tell their gender. I try to just identify them by their name. It may not sound like a huge deal, but it is. It means the world to those sweet kids because they are already so self-conscious of the effects of their treatments. If I could make one change to the world I would make sure everyone had some kind of animal they could be responsible for to give themselves a purpose in life. I’m not easily convinced that my dogs are not part human. They understand and respond to things that I can’t even begin to understand. I will never again underestimate the healing power of the mere presence of an animal. The biggest misperception many people have about therapy animals is that any animal that is friendly and likes people can do it. There’s so much more involved than just that. Golden retrievers are probably the most disloyal dogs there are because anyone who comes up to them is their new best friend! But I wouldn’t trade them for any other breed. As I get older I see the awesome value of having animals around you all the time. When it comes to therapy work, the difference between male and female animals is nothing at all. One of the most heartbreaking situations was a 16-year-old heart transplant patient named Lizzie at Baptist Memorial Hospital. When Tank — one of my goldens — and I entered Lizzie’s room, it was love at first sight! Tank carefully climbed up on her bed, placed his head on her chest, and lay there without moving for an hour while Lizzie petted him. Tank and I continued to visit Lizzie on a daily basis and spent hours talking with her about her life. Over the next months, Lizzie was in and out of the hospital. On our way to visit one day, Tank and I stopped at a sporting goods store. He spotted a stuffed golden retriever on the shelf. He grabbed it and carried his prized possession into Lizzie’s room and presented his gift to her. Throughout Lizzie’s ordeal, Tank visited every day. One day, the doctor informed us that Lizzie needed a heart transplant sooner rather than later. Tank was present when the grim news was given to Lizzie and her family. He was such a calming presence for all. While waiting for a heart, Lizzie had to go back into surgery. Tank and I waited by the phone. Lizzie’s nurse finally called us — in tears: Lizzie was not expected to live more than a few more hours. Tank spent the last hours of Lizzie’s life with her. At her funeral, a picture of Lizzie and Tank was part of the family photos. To this day, whenever Tank and I visit Baptist, Tank still goes down the hallway and peeks his head into Lizzie’s room. To keep my own heart from breaking I pet and hug my dogs and donkeys. Before I die I hope to see registered therapy dogs as a “doctor’s treatment order” for every patient in every medical facility. I want to be remembered as someone who loved her animals even more than herself and had compassion for the human race through the sharing of her animals to those that needed their unconditional love. My final two cents is that not all medicine comes in a bottle.